Main Line Restaurant Week Happy Hour Party at Ella’s! 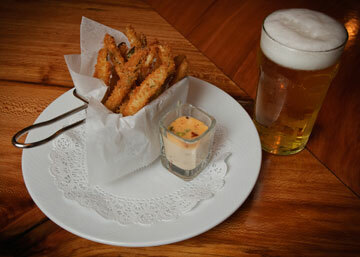 Ella’s famous fried pickles will be part of the complimentary appetizers to be enjoyed in the bar on Friday, April 27th! It is a TGIF not to be missed! Celebrate Spring Main Line Restaurant Week with one of the Main Line’s hottest new restaurants—Ella’s American Bistro! Join us Friday evening, April 27th, as we head into a BUSY Spring Main Line Restaurant Week weekend for cocktails and a casual event at Ella’s in Wayne. We will be meeting up in the bar area to enjoy complimentary appetizers courtesy of Chef Chad from 5pm to 7pm. Plus, make your reservations to dine AFTER our fun happy hour at Ella’s and enjoy their fantastic Main Line Restaurant Week dinner menu. Ella’s recently joined OpenTable so you can click here to conveniently make your Main Line Restaurant Week reservations online. We also advise calling ahead to make reservations to ensure you can secure a table for dinner post this exciting networking event. Attire is Main Line cool and casual, bring plenty of business cards to share and be ready to enjoy the outstanding atmosphere, staff and cuisine at one of the Main Line’s top restaurants. Look forward to welcoming you all to Ella’s on April 27th, a personal fav of mine! And, do not forget Main Line Restaurant Week foodies! Ella’s joins Spring Main Line Restaurant Week with a fantastic $20 3-course lunch menu and a $40, 3-course dinner menu. Make your reservations with Ella’s for Spring Main Line Restaurant Week by clicking here! « Buzz: Main Line Restaurant Week Launch Party at Sullivan’s!